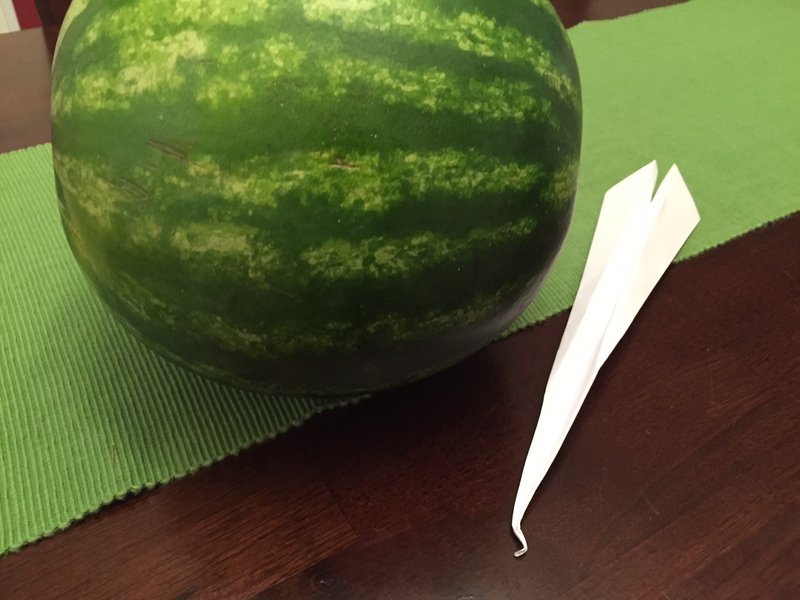 NEW YEAR’S RESOLUTION UPDATE: WEAK PAPER AIRPLANES AND VERY STRONG WATERMELON - What About Watermelon? Nine months. That’s how long I have to accomplish my New Year’s resolution of breaking a Guinness World Record for something — anything — related to watermelon. I’d like to be brave and attempt on the current watermelon records for smashing watermelons with my head or crushing them with my thighs, but my first world record attempt will be something a little less physically demanding. In fact, the biggest risk with this feat is getting a paper cut. That’s because my first Guinness attempt will be the record for the “Most Paper Airplanes Thrown into Watermelons in One Minute.” According to the Guinness website, the official tally is 12, and it’s a record held by Junguk Lee of South Korea. Twelve. That’s it! Yes, I can see that framed Guinness World Record Holder certificate hanging on my living room wall now. I can also see my wife telling me to move it to the wall behind the door in the guest room. The first thing I needed to do was make some paper airplanes. I also knew the airplanes had to have firm, pointy noses to allow them to pierce the hard rind of the watermelon. No problem! Ten minutes later, I had six pointy-nosed airplanes. They looked more like watermelon-piercing fighter jets if you asked me. I poked the tip of one against my finger. Pointy. Very pointy. This was going to be easier than I thought. I stood about four feet away from my watermelon, wound up with my paper creation, and let ‘er rip like a 95-mile-per-hour fastball. The first airplane sailed a full 12 inches above the watermelon. Okay. No big deal. I’m just getting warmed up. I reared back with airplane number two and flung it forward with even more force than the first. It glanced off the side of the watermelon and careened towards our cat, who promptly pounced on it and claimed the aircraft for his own. Maybe I was standing too close. I took a step back and hurled another plane toward the round, green target. Bull’s-eye! Airplane number three landed smack dab in the center of the watermelon. Unfortunately, the flight also crumpled the nose of the airplane and left it lying in a sad little heap on the countertop. The watermelon, on the other hand, showed no signs of damage. So, maybe this wouldn’t be as easy as I had thought. I needed to work on my throwing accuracy, and I definitely needed to work on creating sturdier airplanes. The latter point was driven home after a closer reading of the record on the Guinness website. Turns out, Mr. Lee of South Korea prepared over 50 paper airplanes for his record-setting attempt, and EACH airplane took six minutes to create. Yep, lots of work and lots of practice lies ahead over the next 30 days. Stay tuned for my official world record attempt next month to see if all that practice pays off.